Enter Donna Prior, Green Ronin’s events manager. I told her what I wanted and wow, did she deliver. 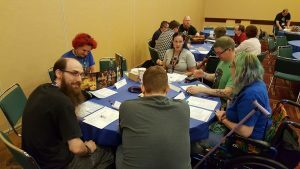 We had over 90 scheduled events this year and GenCon gave us a dedicated room for them on the second floor of the convention center. 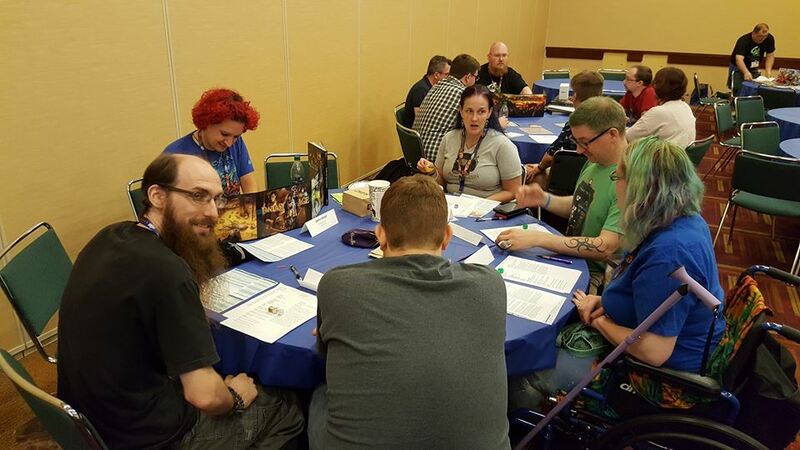 Going into that room and seeing tables full of gamers playing Fantasy AGE, Dragon Age, Mutants & Masterminds, and A Song of Ice and Fire Roleplaying was amazing. So thanks to all the GMs who helped make it happen, and of course to Donna for all her efforts. Having all our games in one area created a great energy, and I had people coming up to me at our booth to tell me that they wanted to GM for us next year. A big part of gaming is community and it was great to see such growth in our community of GMs and supporters. If you’d like to be part of this next year, go over to our website and check out this article that Donna wrote earlier this year. We’ll be posting a new call for GMs next year, but in the meantime you can see what the deal is. Basically, if you run enough games for us, we’ll pick up your badge and maybe even part of your hotel room. 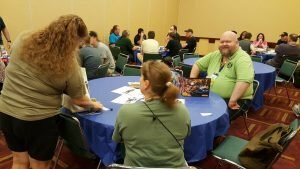 So what do we look for in a game master? Well, first of all someone who can run an entertaining game in 2-4 hours. This will be the first time many folks will be playing one of our games and we want them to have a good time while seeing what the game has to offer. This means you also should have a strong grasp of the rules of the game(s) you want to run. People should leave a demo with a solid understanding of the game’s features, so they can assess whether it’s right for them and their group back home. We also expect a level of professionalism from our GM volunteers, as you are the “face” of Green Ronin at the games you run. The game itself is the fun part but before that there is some basic organizational stuff you need to be on top of. While GenCon is not until August, planning for it begins much earlier than that. GenCon has firm dates by which events must be submitted, badge info provided, and so on. One of the benefits of working with us is that Donna sends out emails with reminders of what needs to be done and notes on how to do it. You need to be able to keep up with those emails and follow the instructions. If you have questions, just ask Donna. She is there to help facilitate this process. Several of our GMs have also gone on to work with us in other capacities, including freelance work writing and designing for the games they love. We’ve already had some new GMs sign up and that’s awesome. We’re also going to be commissioning some new adventures for our various game lines, so GMs will have more to choose from (and folks are always welcome to write their own if they prefer). I look forward to our game room next GenCon. Whether as a GM or a player, please join our Green Ronin community! Ronin Round Table: Unexpected Heroes M&M Bundles of Holding!